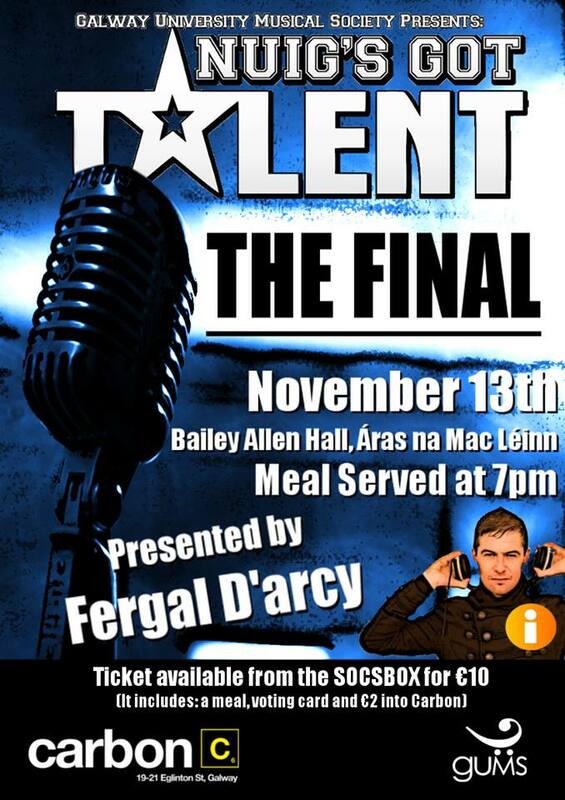 For the fourth year in a row, one of GUMS’ biggest events of the year, NUIG’s Got Talent, is set to hit the Bailey Allen Hall. After three tense heats taking place in the college bar throughout October, the final of NUIG’s Got Talent is now ready to go. 11 talented acts are preparing to compete for the €1000 grand prize on Wednesday 13 November. The evening will be hosted by iRadio’s Fergal D’Arcy and judged by DramSoc’s Kori Kilduff, Galway Musical Society co-founder Seán Power, and Carbon’s well-known DJ Byrno. Amongst the 11 NUIG students performing there are seven singers of very varied styles. There’s an improv group; ‘Staged and Confused’, two beat boxers, and a break-dancer. The night includes a dinner served by the college bar, a voting card that gives you a say in who wins the big cash prize, a night of entertainment, and a wristband that lets you skip the queue and gives you discounted entry to the official after-party in Carbon Nightclub. A night of fun and top-class entertainment awaits the attendees of NUIG’s Got Talent. Tickets are €10 and are available from the Socs Box and from Smokey’s Café between 12 and 4 on Monday 11 November.